Sun Bets promo code - New customer offer to get you started today! Our original review is below. The latest Sun Bets promo code gives you a free bet when you deposit and bet for the first time. The Sun newspaper – we all know it, and we all have differing opinions of it. A light-hearted look at the day’s news, or a rag that picks and chooses its information. They have branched out into the world of betting, and aim to combine their love of sports and banter, with your love of making money from it all. It will come as a bit of a surprise to many, but, to be fair, they’re doing a good job, and there’s plenty to like about the service. 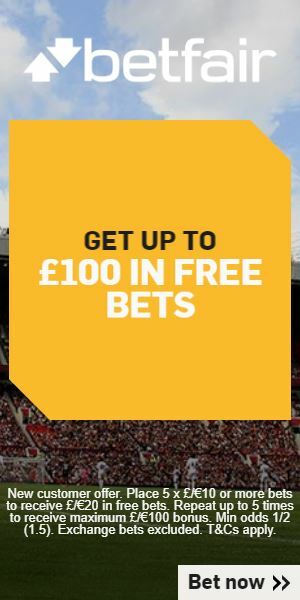 To get you interested – we’re all intrigued by how the Sun will approach betting, let’s be honest – Sun Bets will give you a £10 welcome bonus when coming over to try out their site. All you have to do to get your free bet is register for a new online account, deposit upwards of £5 and they will give you a free bet, enough to scope the place out and see what’s good. Of course, there are better new customer offers out there, offering anything up to £200, but Sun Bets know you’re wanting to test the water first. So, this deal means you can have a play, and all for minimum risk to your bank balance. During the sign-up process, which is quick easy, you can enter promo code G10 when making your deposit, and that ensures the £10 bonus will be dropped into your new account. You now, thanks to Sun Bets, have a handy balance to go and try out the site, from their horse racing and football offering to the popular Sun Boosts. More of that one later. They are so confident you’ll love what you find there that you’ll be back so, from their point of view, the £10 free is worthwhile for all concerned. There are a few T&Cs worth noting here, but it’s general housekeeping, and nothing that’s going to come as a massive shock. Here’s the pick of what you should know – your first bet to qualify for the bonus must be on a sportsbook market with odds of 1/2 or better, and you’re not able to cash out on qualifying bets, while non-runners also don’t count towards your freebie. The bonus will be credited to your account within 48 hours, and you have 30 hours to use it or it expires. We’ll go into detail next on various aspects of the sportsbook so you can see exactly what’s on offer once you’re up and running. Sun Bets are still in the very early stages of planning their assault on the promotions market, but they are beginning to take shape. Sorting out best odds guaranteed on horse racing was a pressing issue, but now that they have done it, they must be given credit. Surely, we all know what best odds guaranteed is, and just why you need to have it when placing your bets. It means you can get on with confidence. Back your selection and take the price, knowing that if the SP is bigger, you will get paid out at the better odds. This works both ways, meaning you’ll never be short changed. They are also giving away a free bet exclusively for horse racing players. This is a shrewd move, as keeping followers of racing sweet is a route to success in this game. When opening your new Sun Bets account, if the free £10 bet doesn’t take your fancy, you can also place £10 on any horse race and they’ll give you £20 free. Half of that free bet is to be used on the sportsbook, the other half on casino. Designed to help bridge the gap between their different platforms, it also gives sports backers a chance to sample casino betting for no risk. All great deals, but the firm really come into their own with the Sun Bet Boosts promotion, which is their headline act. On the homepage you’ll find the Sun Boosts tab, click that and there’s a list of the day’s most popular markets, which have been boosted in price by their traders. There’s nothing astonishing here, but through the newspaper they know what has got people talking, and they know what you’ll be betting on. So, they aim to ensure you place those bets with them by offering a bit more of a price on the markets that you love. Knocked up a point or two, it’s always worth checking what’s on there before placing your bets. In The Sun works in a very similar way. What’s been making news this week – they will tie that in to their offers. So, for example, the latest from planet football, they’ll give an enhanced odds acca, needle between two fighters in the boxing world, they’ll offer prices on any potential bout, or there’s even cross-overs, combining international football with politics, like only the Sun could. This is where you’ll see their unique sense of humour come into play. The Novelty bets section offers a chance to break away from the norm and have a bet on special markets, such as Sports Personality of the Year, or the Oscars, something that’s going to give you a long-term interest. If you have something in mind for the future, get in early to secure the value and enjoy the wait and things fall into place over the course of the coming months. Sun Bets have a decent in-play offering, meaning you can bet on a number of live sports, on an ever-increasing number of markets. Here’s what’s good about in-play betting, if you haven’t yet sampled the joys – while watching the live football, for example, you can have your say on a number of outcomes, including next scorer or team to win. If you see a pattern emerging, perhaps a player getting his share of early chances, jump on him to score next. In-play betting gives you an interest throughout the match. Is there a Sun Bets promo code for existing customers? Sun Bets have plenty of ongoing promotions to keep you busy. If you want to check the latest, click on the banner above to head over the Sun Bets site then click onto the promotions tab. This is where you’ll find everything that’s available for both new and existing customers. Note that since the football season started they have been boosting the new customer offer with various enhanced odds style promotions. Typically this will be an add-on to the usual free bet, conditional on something happening. For example, if a certain player scores in 90 minutes you’ll get an extra tenner free bet in addition to the initial £10! Promo code Promo code required? YES. Your first bet after Sun Bets sign up must be at least the minimum to qualify on any sport, at odds of 1.5 (1/2) or greater. Further terms Deposit method, withdrawal restrictions and further terms apply. Sun Bets offer a mobile app or mobile version of their website, both do the job when it comes to placing bets on the move. There are a number of advantages to downloading the free app however, including Touch ID log in, access to information on the day’s horse racing, from going to form and build your betting calendar. You can also cash out, place your live bets or check today’s results. There’s everything you need from the desktop version of the site right there in your pocket, and it’s very easy to use. Payment methods are another example of Sun Bets being a new set-up, and they do little more than the basics here. That should be more than enough for most punters, but it does show them up when judged against the competition. To get funds in or out of your account you can use all major credit/debit cards. It’s all safe and secure. Funds are available immediately when depositing, allowing you to place bets quickly, while withdrawals are subject to the usual 3-5 working days waiting period. Sun Bets customer service – how will you be treated? Sun Bets Live Chat is manned 24/7, meaning you are always one click away from assistance from the customer service team, should you need it. You can also telephone or email for help, but the FAQs site gives a glossary of questions and answers, allowing you to troubleshoot without having to speak to anyone, cutting out waiting times. The key information around this sign up offer can be found in the info box just above. This explains the main things to be aware of when you join Sun Bets – these are intended to make you aware of the most important terms only. The full terms and conditions must be confirmed on the Sun Bets site before you proceed. We have taken the decision NOT to republish them here as they are regularly subject to change and we want to ensure you have seen the latest version before registering.